On February 12, 2014 Gabriel Arcaro was introduced on the floor of the Massachusetts State House of Representatives by the Speaker DeLeo. 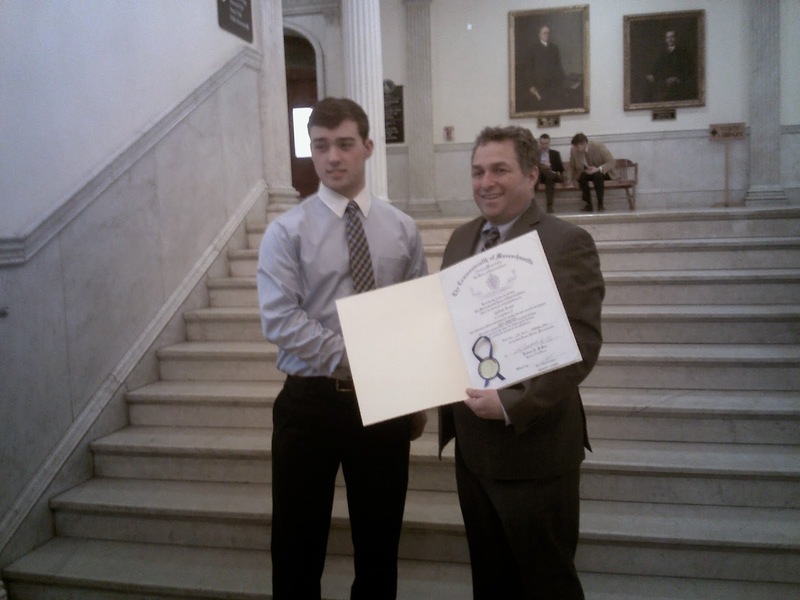 Burlington Representative Kenneth Gordon arranged for Gabriel and his family to tour the State House and receive a commendation for his athletic efforts. You can see his introduction on the House of Representatives floor here (Gabriel's part begins at around 18 minutes 30 seconds in). Gabriel is a nationally ranked hammer thrower. The hammer is a track and field implement that is not thrown in high school competitions in the State of Massachusetts, but is thrown in colleges. Gabriel competes out of state and at college open meets. He currently holds the boys high school hammer throw record for the State of Massachusetts. His current personal record is 208.10 feet.